A.D. 81 ( LXXXI ) was a common year starting on Monday (link will display the full calendar) of the Julian calendar. At the time, it was known as the Year of the Consulship of Silva and Pollio (or, less frequently, year 834 Ab urbe condita ). The denomination A.D. 81 for this year has been used since the early medieval period, when the Anno Domini calendar era became the prevalent method in Europe for naming years. A common year starting on Monday is any non-leap year that begins on Monday, 1 January, and ends on Monday, 31 December. Its dominical letter hence is G. The most recent year of such kind was 2018 and the next one will be 2029 in the Gregorian calendar, or likewise, 2013 and 2019 in the obsolete Julian calendar. The century year, 1900, was also a common year starting on Monday in the Gregorian calendar. See below for more. Any common year that starts on Sunday, Monday or Tuesday has two Friday the 13ths. This common year of this type contains two Friday the 13ths in April and July. Leap years starting on Sunday share this characteristic, but also have another in January. September 14 – Domitian succeeds his brother Titus as emperor. Domitian is not a soldier like his two predecessors, and his administration is directed towards the reinforcement of a monarchy. By taking the title of Dominus ("lord"), he scandalizes the senatorial aristocracy. Romanisation progresses in the provinces, and life in the cities is greatly improved. Many provincials – Spanish, Gallic, and African – become Senators. The Arch of Titus is constructed. Pliny the Younger is flamen Divi Augusti (priest in the cult of the Emperor). Domitian was Roman emperor from 81 to 96. He was the younger brother of Titus and the son of Vespasian, his two predecessors on the throne, and the last member of the Flavian dynasty. During his reign, the authoritarian nature of his rule put him at sharp odds with the senate, whose powers he drastically curtailed. The silver content of the Roman denarius rises to 92% under emperor Domitian, up from 81% in the reign of Vitellius. Silver is a chemical element with symbol Ag and atomic number 47. A soft, white, lustrous transition metal, it exhibits the highest electrical conductivity, thermal conductivity, and reflectivity of any metal. The metal is found in the Earth's crust in the pure, free elemental form, as an alloy with gold and other metals, and in minerals such as argentite and chlorargyrite. Most silver is produced as a byproduct of copper, gold, lead, and zinc refining. The denarius was the standard Roman silver coin from its introduction in the Second Punic War c. 211 BC to the reign of Gordian III, when it was gradually replaced by the Antoninianus. It continued to be minted in very small quantities, likely for ceremonial purposes, until and through the tetrarchy (293–313). Vitellius was Roman Emperor for eight months, from 16 April to 22 December 69 AD. Vitellius was proclaimed emperor following the quick succession of the previous emperors Galba and Otho, in a year of civil war known as the Year of the Four Emperors. AD 79 (LXXIX) was a common year starting on Friday of the Julian calendar. At the time, it was known as the Year of the Consulship of Titus and Vespasianus. The denomination AD 79 for this year has been used since the early medieval period, when the Anno Domini calendar era became the prevalent method in Europe for naming years. The 90s ran from 90 AD to 99 AD. AD 96 (XCVI) was a leap year starting on Friday of the Julian calendar. At the time, it was known as the Year of the Consulship of Valens and Vetus. The denomination AD 96 for this year has been used since the early medieval period, when the Anno Domini calendar era became the prevalent method in Europe for naming years. AD 39 (XXXIX) was a common year starting on Thursday of the Julian calendar. At the time, it was known as the Year of the Consulship of Augustus and Corbulo. The denomination AD 39 for this year has been used since the early medieval period, when the Anno Domini calendar era became the prevalent method in Europe for naming years. AD 64 (LXIV) was a leap year starting on Sunday of the Julian calendar. At the time, it was known as the Year of the Consulship of Bassus and Crassus. The denomination AD 64 for this year has been used since the early medieval period, when the Anno Domini calendar era became the prevalent method in Europe for naming years. AD 71 (LXXI) was a common year starting on Tuesday of the Julian calendar. At the time, it was known as the Year of the Consulship of Vespasian and Nerva. The denomination AD 71 for this year has been used since the early medieval period, when the Anno Domini calendar era became the prevalent method in Europe for naming years. AD 84 (LXXXIV) was a leap year starting on Thursday of the Julian calendar. At the time, it was known as the Year of the Consulship of Augustus and Sabinus. The denomination AD 84 for this year has been used since the early medieval period, when the Anno Domini calendar era became the prevalent method in Europe for naming years. AD 91 (XCI) was a common year starting on Saturday of the Julian calendar. At the time, it was known as the Year of the Consulship of Glabrio and Traianus. The denomination AD 91 for this year has been used since the early medieval period, when the Anno Domini calendar era became the prevalent method in Europe for naming years. AD 95 (XCV) was a common year starting on Thursday of the Julian calendar. At the time, it was known as the Year of the Consulship of Augustus and Clemens. The denomination AD 95 for this year has been used since the early medieval period, when the Anno Domini calendar era became the prevalent method in Europe for naming years. Domitia Longina was a Roman empress and wife to the Roman emperor Domitian. She was the youngest daughter of the general and consul Gnaeus Domitius Corbulo. Domitia divorced her first husband, Lucius Aelius Lamia Plautius Aelianus in order to marry Domitian in AD 71. The marriage produced only one son, whose early death is believed to have been the cause of a temporary rift between Domitia and her husband in AD 83. She became the empress upon Domitian's accession in AD 81, and remained so until his assassination in AD 96. She is believed to have died sometime between AD 126 and AD 130. The Flavian dynasty was a Roman imperial dynasty, which ruled the Roman Empire between 69 AD and 96 AD, encompassing the reigns of Vespasian (69–79), and his two sons Titus (79–81) and Domitian (81–96). The Flavians rose to power during the civil war of 69, known as the Year of the Four Emperors. After Galba and Otho died in quick succession, Vitellius became emperor in mid 69. His claim to the throne was quickly challenged by legions stationed in the Eastern provinces, who declared their commander Vespasian emperor in his place. The Second Battle of Bedriacum tilted the balance decisively in favour of the Flavian forces, who entered Rome on December 20. The following day, the Roman Senate officially declared Vespasian emperor of the Roman Empire, thus commencing the Flavian dynasty. Although the dynasty proved to be short-lived, several significant historic, economic and military events took place during their reign. The gens Flavia was a plebeian family at Rome. Its members are first mentioned during the last three centuries of the Republic. 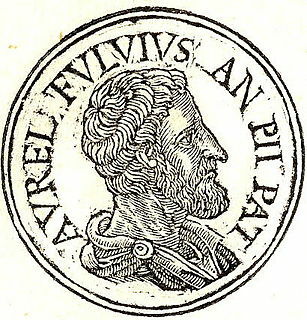 The first of the Flavii to achieve prominence was Marcus Flavius, tribune of the plebs in 327 and 323 BC; however, no Flavius attained the consulship until Gaius Flavius Fimbria in 104 BC. The gens became illustrious during the first century AD, when the family of the Flavii Sabini claimed the imperial dignity. Titus Flavius T. f. T. n. Clemens was a nephew of the Roman Emperor Vespasian. He was the son of Titus Flavius Sabinus, consul suffectus in AD 69, and a brother of Titus Flavius Sabinus, consul in AD 82. The emperors Titus and Domitian were his cousins. In the 1st century, there were two men with the name Titus Aurelius Fulvus. One was the paternal grandfather and the other the father to the Roman Emperor Antoninus Pius. De vita Caesarum, commonly known as The Twelve Caesars, is a set of twelve biographies of Julius Caesar and the first 11 emperors of the Roman Empire written by Gaius Suetonius Tranquillus. See also Titus Flavius Sabinus (disambiguation) for other men of this name. ↑ "BBC - History - Historic Figures: Titus (39 AD - 81 AD)". www.bbc.co.uk. Retrieved 7 April 2019.